Euclid will be carried into a direct transfer orbit by a Soyuz ST 2-1b launch vehicle departing from Europe's Spaceport in French Guiana. 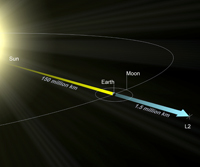 The transfer phase to the target orbit around the second Sun-Earth Lagrange point, L2, will last approximately 30 days. A correction manoeuvre will be performed about two days into the flight, once sufficient tracking data have been acquired to evaluate the radial velocity error, which arises due to uncertainties in the conditions during launch. Commissioning of the spacecraft and instruments will start during the transfer phase. No insertion manoeuvre is needed to reach the chosen orbit. A large-amplitude (~ 1 × 106 km) halo orbit around the second Lagrange point of the Sun-Earth system (L2) has been selected because it offers optimum operating conditions for Euclid: a benign radiation environment, which is necessary for the sensitive detectors and very stable observing conditions, which are sufficiently far away from the disturbing Earth-Moon system. In addition, the amount of propellant necessary is very favourable compared to alternative orbits. To cope with the unprecedented science data volume generated by Euclid in L2, K-band (25.5-27 GHz) communications will be used, which offer a transfer rate of 55 Mbit/s. As a consequence of the large variations in the Sun-spacecraft-Earth angle, a two-degrees-of-freedom mechanism for the antenna is needed to maintain the science telemetry link to Earth. The selected orbit is eclipse-free. Station-keeping manoeuvres will be performed every 30 days throughout the operations phase of the mission. During its lifetime the Euclid mission will deliver an unprecedented large volume of data for a space mission: about 850 Gbit of compressed data per day. Lossless compression will be applied, with compression rates of the order 2 to 3. This data stream will be handled by the Euclid ground segment. The concept for the establishment of the Euclid ground segment will maximise the sharing and re-use of the manpower, facilities and tools of the Science Observatory family of missions. Nominal spacecraft control during most of the commissioning and routine operational phases will be 'off-line'. The Euclid spacecraft will have onboard capabilities such that it is able to perform corrective actions in case of anomalies. The ground segment will not need to monitor the spacecraft in real time. All control, telecommand and housekeeping telemetry communications with Euclid will be performed via X-Band (8.0-8.4 GHz). K-band (25.5-27 GHz) will be used for the science data downlink. 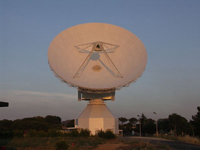 The ground station network for Euclid during the Launch and Early Operations Phase (LEOP) will be composed of the 15-metre antenna at Kourou and the 35-metre antennas at New Norcia and Cebreros (or the Cebreros antenna in combination with the 15-metre antenna at Maspalomas). This network gives almost 24-hour coverage of the spacecraft during this critical period. For all subsequent phases, the 35-metre antennas at the Cebreros ground station in Spain or the Malargue ground station in Argentina will be used for all communications with Euclid. Both are equipped with K-band receivers. The daily telecommanding and communications period will be 4 hours. The rest of the day the spacecraft will be operating without ground contact. The Mission Operations Centre (MOC), which looks after the ground segment and operations infrastructure for the flight operations segment of the Euclid mission, will be set up at ESA's European Space Operations Centre (ESOC) in Darmstadt, Germany and will be based on an extension of the existing ground segment infrastructure, customised to meet the specific requirements of this mission. The MOC will operate the spacecraft and deliver the raw scientific data to the Science Ground Segment. 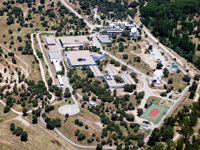 The Euclid science ground segment consists of the Science Operations Centre, located at ESA's European Space Astronomy Centre (ESAC) in Villanueva de la Cañada, Spain, plus a number of Instrument Operation Centres and Data Centres provided by the Euclid Science Consortia. The SOC will be responsible for enabling the scientific survey operations by preparing the sky scanning strategy for Euclid, planning the surveys, scheduling the observations and monitoring the performance of the surveys. The SOC will act as interface between the MOC and the instrument consortia for all aspects concerning the operation and monitoring of the scientific instruments. Dedicated teams from the scientific consortia will process data from the instruments during all phases of the mission through the Instrument Operation Centres and the Science Data Centres. The data handling system includes a common archive, the Euclid Mission Archive, which is accessible by all priviledged parties in the project. Once calibrated and qualified the data products will be stored in the Euclid Legacy Archive for which the SOC will act as custodian. This archive will be accessible by the astronomical community at large. Euclid will survey the sky in 'step-and-stare' mode: the telescope will point to a position on the sky and imaging and spectroscopic measurements will be performed on an area of ~0.5 deg² around this position. 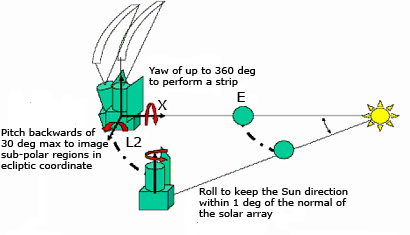 The L2 orbit and spacecraft viewing constraints; the Sun-spacecraft line will move 1 degree per day in the plane of the ecliptic. Maintaining the thermal stability of the spacecraft forces the pointing direction to be as much as possible perpendicular to the Sun-spacecraft axis with the sunshield of the spacecraft facing the Sun. This means that on a given day in the mission the viewing area is mostly confined to a great circle perpendicular to the Sun-spacecraft axis. The fundamental exposure times of the instruments and the size of a field, which is 0.5×1.0 deg². For the imaging channels, dithering is required to over-sample the point-spread-function to fill the gaps between the detectors, and to ensure that the field is completely covered. On a daily basis, Euclid will observe strips: these are observations of adjacent sky fields along a great circle of (roughly) constant ecliptic longitude. A strip of order 15-20 degrees long can be covered, depending on the geometry of the instruments field of view and the integration time per field. During the assessment study, a field of 0.5 degree wide and an exposure time per field of 4000 s has been assumed, in that case the daily coverage would be a strip of about 18 degrees. The extragalactic sky is presently defined by the regions covering |b|>30 degrees. The alignment of the galactic plane with respect to the ecliptic plane causes the extragalactic sky to be poorly accessible during the equinoxes (i.e. around 21 March and 21 September). The deep survey will cover ~40 deg², and consists of patches of at least 10 deg² which are about 2 magnitudes deeper than the wide survey. The deep survey is obtained by regular visits to the same areas on the sky at regular intervals during the mission. The same observing mode as for the wide survey is used to monitor the temporal stability of the system.